Batman: Sins of the Father is exactly the kind of storyline I wish comic book companies would do more often. It’s an entry level story that doesn’t require an intimate knowledge of the entire Batman lore since the 1940s. Pertinent elements are developed within (with one exception). 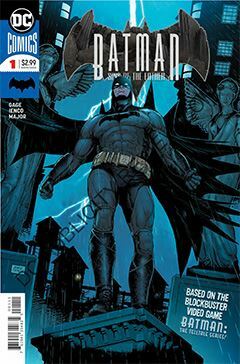 The story begins with the revelation that Dr. Thomas Wayne colluded in committing innocent people to Arkham Asylum, that he and crime boss Carmine Falcone could consolidate their power over Gotham. Now public knowledge, Wayne Enterprises has become a house of cards, and Batman’s crime fighting arsenal is in jeopardy. Now, someone has targeted the surviving staff of Dr. Wayne’s reign of terror. Though present, they were coerced, but that doesn’t matter to the assassin, later revealed to be Floyd Lawton (Deadshot). In many ways, this could be regarded as his origin story. It could also be regarded as an “elseworld’s” story, featuring a redesigned Batman and an alternate version of Alfred. Raffaele Ienco demonstrated initiative – no doubt with the approval of DC Editorial – to recreate Batman’s world in a manner that is both fresh and accessible. While Ienco’s work is polished and professional, I discerned what might be described as a “too consistent” sense of design to his pages. But that may come from reading all the chapters in one sitting, and it’s a small price to pay for what is otherwise a terrific Batman story. It is one part psychological thriller, one part crime drama, both of which feed the conflict. A couple of decades ago, The Killing Joke offered insight to Batman’s psychosis, by placing his personal tragedy side-by-side with that of his longtime arch foe, the Joker. This story does the same by comparing Bruce Wayne to Floyd Lawton. Both are the sons of wealthy families who suffered terrible tragedies, but while those events may have been catalysts, it is the aftermath that becomes the crucible for their adult identities. 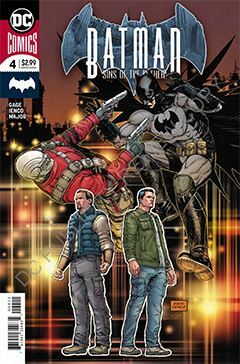 A charming element to the overall story is the number of references to Batman's publication history, beginning with an homage to Detective Comics #27. Throughout, various cops on the GCPD are named for previous Batman artists, many of them under appreciated these days. It's nice to see someone remembers.